To get started you will need to buy some needles and some yarn. I would suggest a size 8 14" needle and some worsted weight yarn. For how to cast on, knit and purl go to the BASIC STITCHES section. There are wooden, aluminum and plastic needles. TIP: They used to make knitting needles out of bone, and if you have or find any you should consider them collectibles and hold on to them as they are very valuable. There are long needles, short needles, double pointed and round circular needles. The project will determine what size and length needles you will need and only you can decide which material you prefer in your hands. 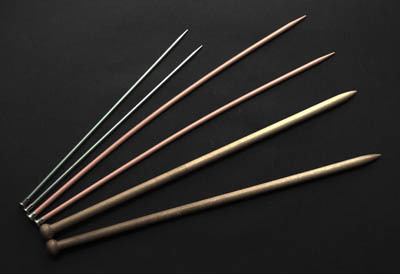 Straight knitting needles are the most commonly used. They come in varying sizes, from 0 (2 mm), the smallest, to size 15 (10 mm) and even larger. They are sold in pairs, come in 10" or 14" lengths with a point at one end of the needle, and a knob at the other, which prevents stitches from slipping off. Note that in the photo the pink needles are plastic and are a bit warped. Plastic needles tend to do that from the weight of yarn. For large projects like afghans circular knitting needles can be used. They also come in wood, aluminum and plastic and are available in most sizes. 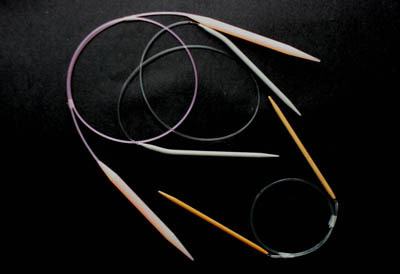 Circular needles are long and flexible and have points at both ends. For large projects they would be knitted back and forth as though it were a straight needle, but the benefit of the circular is that it can hold many more stitches. For smaller projects that do not have seams (socks, caps and mittens) you can use a small circular needle. Your other choice would be to use double-pointed needles. These come in sets of four and are pointed on each end. On both circular and double pointed needles you are "knitting in the round" so you are always knitting every row instead of one row knit, one row purl. There is more information and instruction on how to use circular and double pointed needles under the TIPS section. TIP: Always wipe off your needles before you start using them. 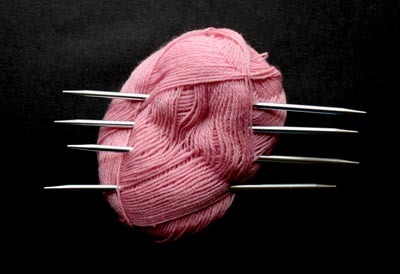 Doing this will ensure there is not a dark line or dirt spot on your knitting.